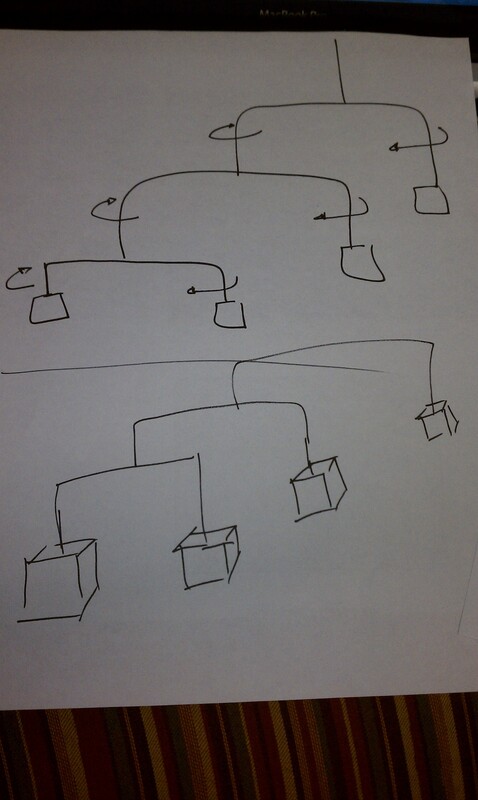 I began thinking about how this mapping from 2D to 3D on a piece of paper occurs. There has a been a lot of research about projecting line drawings onto different planes to see when we see a 3D object. At first, I thought that an autostereogram would help demonstrate the potential for a 2D object to become 3D, but then I realized it was a bit limiting since it cannot really be realized and compared as rapidly as other 3D viewing techniques. So I decided to go with stereovision. There is a Stereo library fro Processing that is fun to play with, but in the end it seemed like it would be easiest to write my own version. 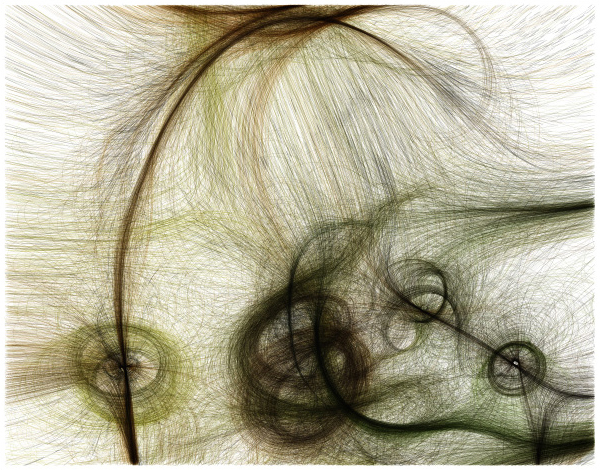 The first program allows you to draw lines, or trails with the mouse and then create a stereo version of the image. It then shifts in place to pop out or pop in, generating a flip-book of sorts of the image you created. The second program allows you to draw points on the canvas and then watch as lines randomly form between them to see what kind of 3D objects you can make with a given point range. and see if this could be a tool for designing 3D origami forms that seem like they would be impossible. I’ve always been a big fan of abstract art, letting the stories twirl in my head around the shapes or along the brushstrokes. In this project, I ask, can robots walk through the space of emotional expression to achieve the same effect? The human mind is wonderful at making abstract connections, creating narrative and attributions of intent. My clay was the Gamebot robot, a three-axis head and screen. Eventually intended to play boardgames with us on a touchscreen surface in the Gates Cafe, the project is led by my advisor Reid Simmons. In the first video below, I show a handcrafted robot expression. Traditionally the software used with this robot, which I had never worked before, has been developed and used for the Robo-Receptionist in Newell-Simon Hall. The Robo-Receptionist has a screen but no head motors, which required some adaptation of the code, as the mapping from ‘simulation’ to ‘robot’ sometimes produced motion that was abrupt, too fast, too slow, or not communicating the desired state/emotion. Another reason to rework the code was to create more variable-based expressive states, in which amplitude and timing are controllable characteristics. The previous software mostly uses a categorical approach to emotions, by which I mean, emotional and expressive robot behaviors are scripted and discrete. The video below shows four possible states of waiting: happy, pensive, sad, mad. The is an example of an emotion model with categorical states. 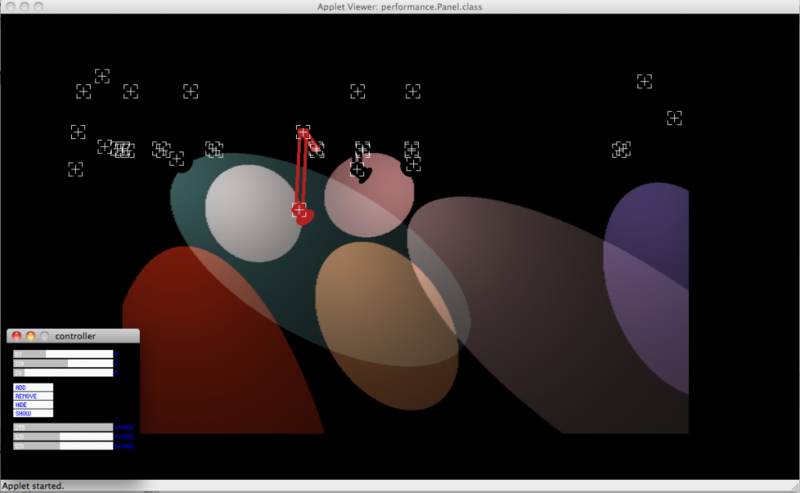 In contrast to this state machine, I show the robot running through continuously varying range of mood valence (this sample is face only, but will be used in conjunction with motion in the following step). Rather than use a state machine for emotion representation, I borrow a function called mood from the Robo-Receptionist to explore the space between happy and sad. By representing the continuous variable, I can next use shifting sequentials and generative algorithms to explore the space of expression. Next, I scripted a branching and looping function to combine mood state with emotion, in the hope that the unplanned creations would evoke stories in us, as we imbue the robot with intent. Throughout evolution, we have used our ability to “read” people and make snap decisions to safely and happily navigate the world. This same unconscious behavior occurs when we see a robot face or robot in motion. The code: define parameters to constrain the lips to transitions between smile – neutral – frown or stay the same, while the head motion explores the space of an outer and inner square. The story: the next step is the interpretation, each generation will be unique. I share my stories for the three videos below, but I invite any of you to craft your own. Watch for the lips and head motion! In I, I see a tale of beauty and intimacy. The camera angles interplay with expression. In II, I see a robot interrupted by an unwanted video camera. The desire to look presentable conflicts with with her frustration at the imposition. Benign bickering likely to follow. 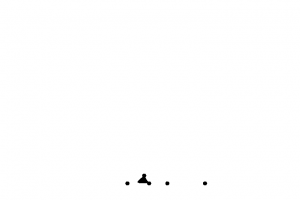 Generative Gamebot II: A Camera, Really?! In III, the robot seems to be gazing into the mirror and thinking, “It’s hard to hide my unhappiness.” It practices smiling, occasionally despairing at the farse and letting it fade again. 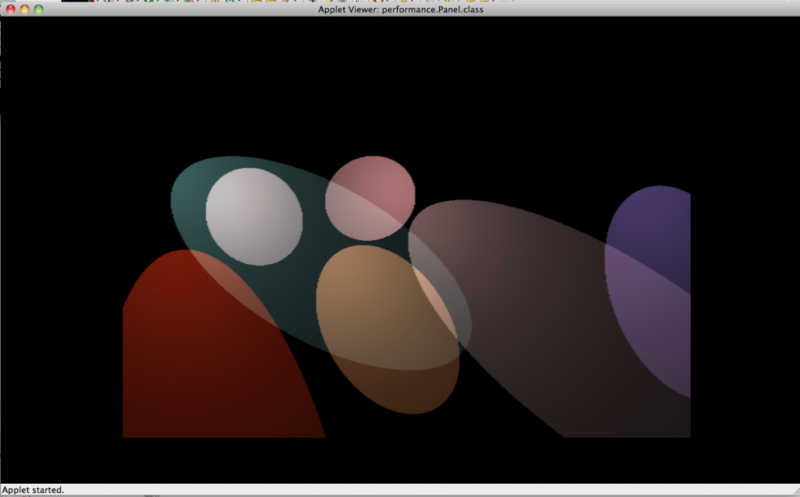 Excited to get a simple model up and running! 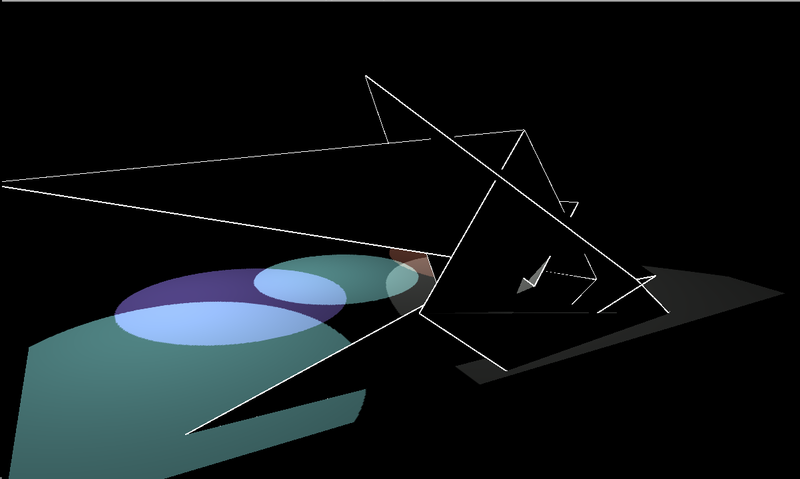 Thoughts about more complex algorithms I could use to explore this space (especially motion) would be awesome! The objective of this project is form generation via a Braitenberg vehicles simulation. A Braitenberg vehicle is a concept developed by the neuroanatomist Valentino Braitenberg in his book “Vehicles, Experiments in Synthetic Psychology” (full reference: Braitenberg, Valentino. Vehicles, Experiments in Synthetic Psychology. MIT Press, Boston. 1984). Braitenberg’s objective was to illustrate that intelligent behavior can emerge from simple sensorimotor interaction between an agent and its environment without representation of the environment or any kind of inference. What excites me about this concept is how simple behaviors on the micro-level can result to the emergence of more complex behaviors on the macro-level. In Vehicles, Braitenberg defines a series of 13 conceptual constructions by gradually building more complex behavior with the addition of more machinery. In the Tissue software, Reas uses machines analogous to Braitenberg’s Vehicle 4. Each machine has two software sensors to detect stimuli in the environment and two software actuators to move; the relationships between the sensors and actuators determine the specific behavior for each machine. 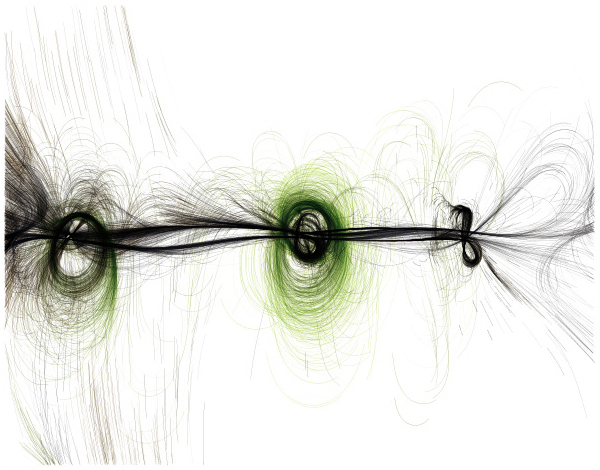 Each line represents the path of each machine’s movement as it responds to stimuli in its environment. People interact with the software by positioning the stimuli on the screen. Through exploring different positions of the stimuli, an understanding of the total system emerges from the subtle relations between the simple input and the resulting fluid visual output. In this project, Braitenburg vehicles move over a 2d imagemap collecting information about light and dark spots (brightness levels). This information is used to construct forms in 3d, either trails or surfaces. What I find interesting about this project is that information from the 3d form is projected back onto the source imagemap. For example, the constructed surfaces cast shaddows on the imagemap. This results in a feedback loop which augments the behavior of vehicles. 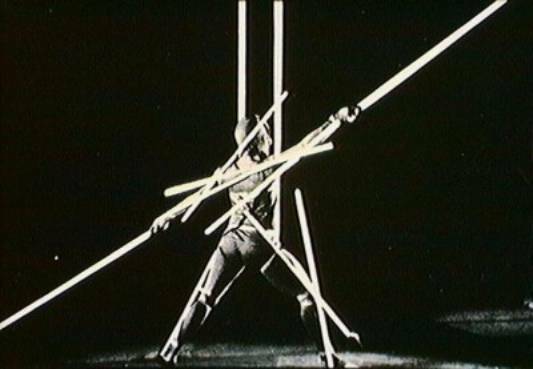 During Bauhaus, Schlemmer was organizing dance performances where the dancer was regarded as an agent in a spatial configuration; through the interaction of the dancer with the spatial container trigger the performance proceeded in an evolutionary mode. “Dance in space” and “Figure in space with Plane Geometry and Spatial Delineations” were performances that intended to transform the body into a “mechanised object” operating into a geometrically divided space, pre-existing the performance. Hence, movement is precisely determined by the information coming from the environment. 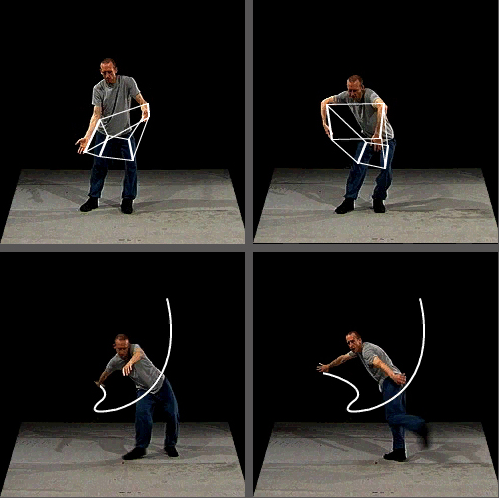 William Forsythe, imagines virtual lines and shapes in space that could be bent, tossed, or distorted. 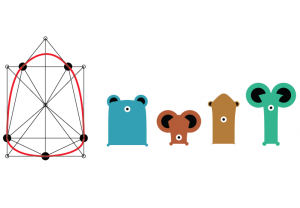 By moving from a point to a line to a plane to a volume, geometric space can be visualized as composed of points that were vastly interconnected. These points are all contained within the dancer’s body; an infinite number of movements and positions are produced by a series of “foldings” and “unfoldings”. Dancers can perceive relationships between any of the points on the curves and any other parts of their bodies. What makes it into a performance is the dancer illustrating the presence of these imagined relationships by moving. A Braitenberg vehicle is an agent that can autonomously move around. It has primitive sensors reacting to a predefined stimulus and wheels (each driven by its own motor) that function as actuators. In its simplest form, the sensor is directly connected to an effector, so that a sensed signal immediately produces a movement of the wheel. 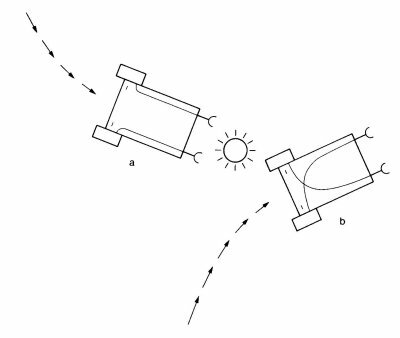 Depending on how sensors and wheels are connected, the vehicle exhibits different behaviors. 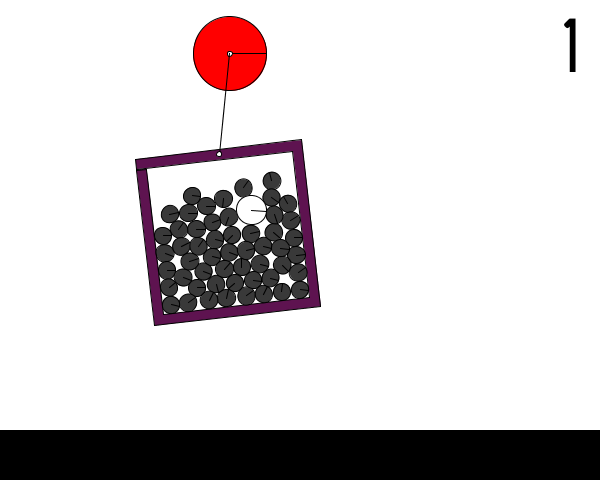 In the diagram below we can observe some of the resulting behaviors according to how the sensors and actuators are connected. In the current project the environment selected to provide stimuli for the vehicles is a 3d stage where a number of spotlights are placed interactively by the user. The light patterns and colors can vary to actuate varying behaviors. 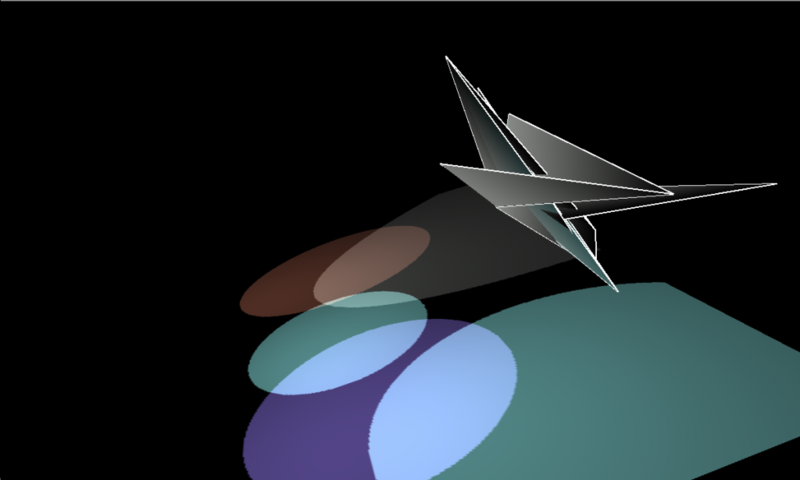 The vehicles can move in 3d space reacting to the light stimuli. The vehicles will be regarded as constituting the vertices of lines or the control points of surfaces which are going to get transformed and distorted over time. The intention is to constraint the freedom of movement of the vehicles by placing springs at selected points. 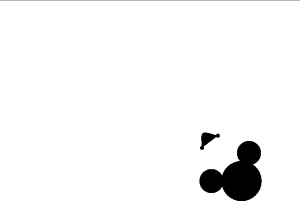 The libraries of Toxiclibs, Verlet Physics and Peasycam are being used. This project is an effort to simulate a battle between two armies. I had planned to simulate an army which comprised of the infantry, cavalry, archers and catapults. I eventually ended by doing a battle simulation with just the infantry. My idea for driven by one of my looking outwards – “Node Garden”, where a set of curves would twirl in space to create nodes. Based on the feedback I got, I focused on simulating the behavior of the infantry. I decided to move the infantry to its nearest enemy. This resulted in biased results, where the infantry turned to the fastest enemy. While brainstorming for the project, I happened across an Alexander Calder Sculpture at the Pitt Airport. 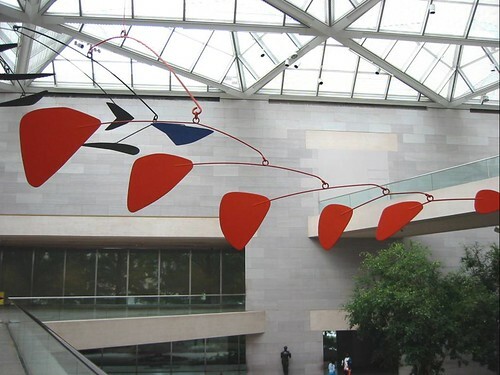 A sculptor whose works I’ve admired for a long time, it struck me as strange that while these hanging sculptures seem so lively and free, hanging in space, they never actually move. At this point I was inspired to generate a hanging mobile that would dance to the music. 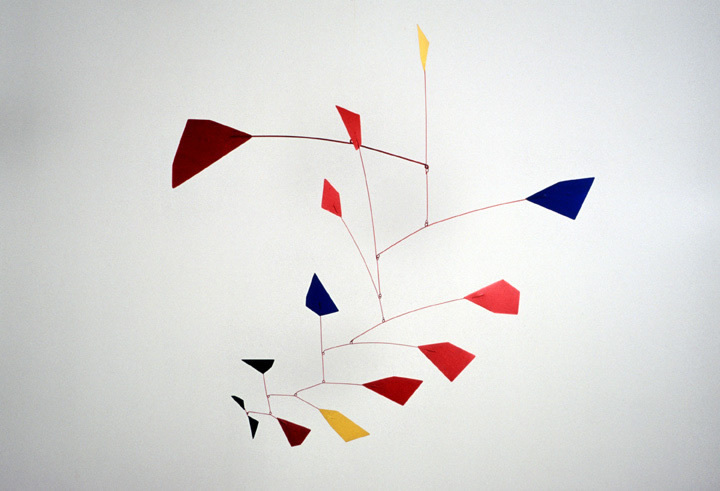 I began by looking at a bunch of Calder mobiles, examining how the different tiers fit together. 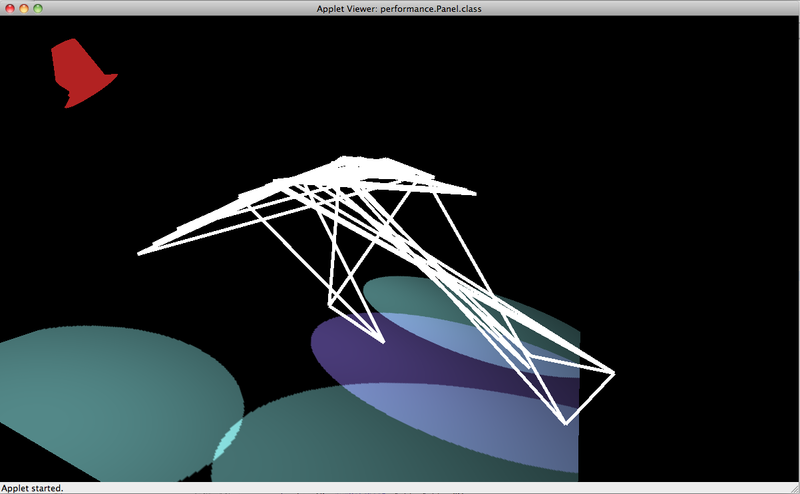 I then went on to examine OpenGL’s 3D library to determine how to generate the shapes in space. After sampling from a processing program that drew cubes, I then needed to figure out how to generate motion. It was at first difficult to think in terms of 3D coordinates, and then to have each tier connected to the above tier and move about in space while still staying connected. In my piece I store the tiers in an array and must calculate the top tier so that the below tier can be found, and so on. As for the music, I used Echonest to analyze Phoenix’s Love Like a Sunset (Turzi RMX). It was particularly difficult to get data because the Processing library that uses Echonoest had version control incompatibilities and wasn’t really working, so I want to thank Kaushal for helping me circumvent it to analyze the song I chose. When I got the data, there was some interesting stuff related to the popularity level, among other things, but with a deeper search I was also able to access more granular data that had second by second analysis of pitches and timbre, etc. 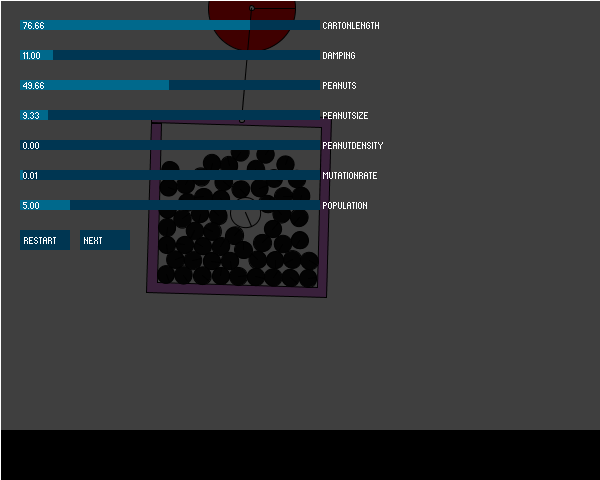 Since I wanted to show motion, I focused on the pitch data, which included over 3,500 segments of analysis for my song. I planned to time the motion of the mobile to the song data. Then I encountered difficulties, because the pitch data was actually 12 pitches, on a scale of 0-1.0, and this could be found for about every 3-5 milliseconds. I couldn’t find any documentation about what the pitches were or why 12 pitches were associated with each segment. At this point it had taken me so long to prep for the data that I just decided to make due with it. I would correlate a range of pitches to a specific tier of the sculpture, and whenever that pitch was played, would move that tier of the mobile. With so much pitch data, I just took the first pitch in the sequence of 12 pitches and used that to determine which tier would move. Originally I wanted only 1 tier to rotate at once and so simplified the data to only update the tier movements about once a second. This however seemed too choppy so I just utilized the appearance of a pitch to begin the tier’s movement. Ideally I’d like the movement to stop for that tier after some time so that it’d make for more interesting movement patterns, however this works as well. Watching how the sculpture moves as the song progresses, as more tiers become involved, as the asynchronous nature of the tiers ebbs and flows is interesting. I wanted to show music doing a dance, something that it is unable to do. I wanted to move away from those electric, space-nebula filled looking music visualizers and do something a bit more relatable. Yes I would have liked to get more relevant data, that had more meaning, the actual note patterns of the song, discretized into pieces that were human understandable or even just supported by documentation. There is definitely room for improvement with this project, but I am happy with it in terms of the fact that I was able to generate motion from music in an inanimate object. I could easily plug in another song’s Echonest analysis file and a completely different dance would arise, and this fingerprinting of songs in a visual way was what I foresaw for my project in its original inception. Evan Sheehan | Project 3 | Science! I’m not entirely sure where the idea for this project came from. I was exploring several ideas for using flocking algorithms when I suddenly thought of evolving solutions to the egg drop problem using genetic algorithms. I recall performing this “experiment” more than once during my childhood, but I don’t think I ever constructed a container that would preserve an egg from a one story fall. 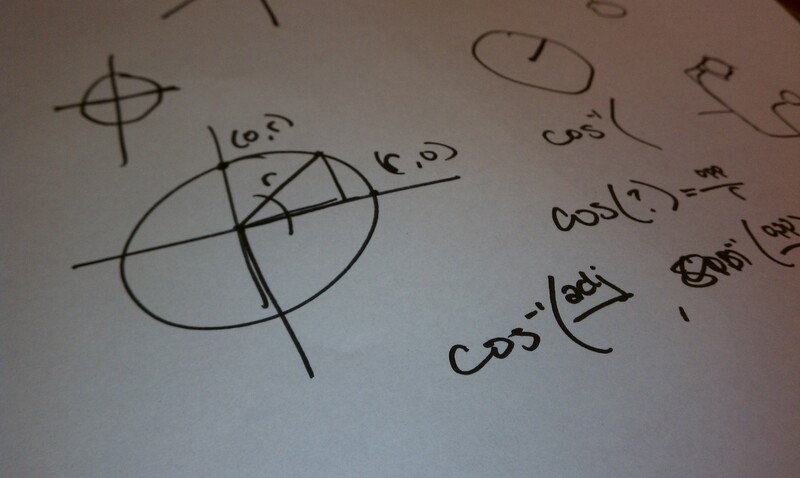 There was something very appealing about revisiting this problem in graduate school and finally conquering it. Box2D made it pretty easy to detect when the egg had collided with the ground. Determining whether or not the egg had broken was simply a matter of looking at its acceleration, and if that was above some threshold (determined experimentally), it broke. What interventions can you make to preserve an egg during a fall? The two obvious solutions are 1) make the egg fall slower so it lands softly and 2) pack it in bubble wrap to absorb the force. These were two common solutions I recalled from my childhood. I used a balloon in the simulation to slow the contraption’s fall, and packing peanuts inside to absorb the impact when it hits the ground. 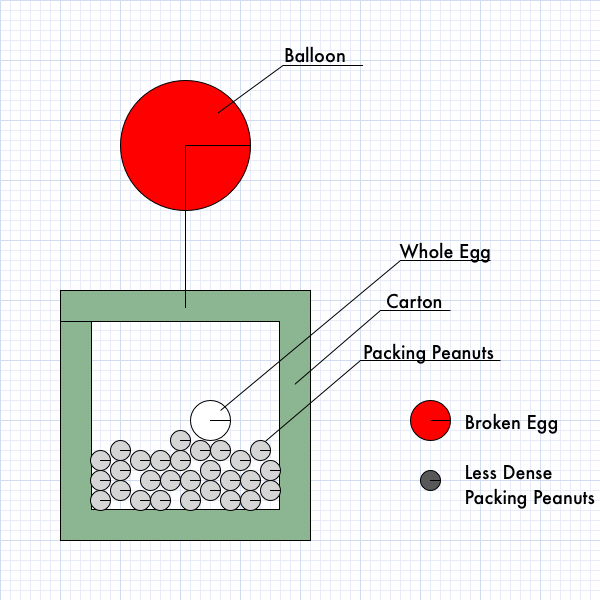 This gave me several parameters which I could vary to breed different solutions: bouancy of the balloons to slow the fall; density of the packing peanuts to absorb shock; packing density of peanuts in the box. Additionally, I varied the box size and the peanut size both of which affect the number of peanuts that will fit in the box. I also varied the color of the container, just to make it slightly more obvious that these were different contraptions. My baseline for evaluating a contraption’s fitness was how much force beyond the minimum required to break the egg was applied to the egg on impact. A contraption that allowed the egg to be smashed to pieces was less fit then one that barely cracked it. To avoid evolving solutions that were merely gigantic balloons attached to the box, or nothing more than an egg encased in bubble wrap, I associated a cost with each of the contraption’s parameters. Rather than fixing these parameters in the application, I made them modifiable through sliders in the user interface so that I could experiment with different costs. My initial idea for this project was to simulate a line or a crowd, by implementing a combination of flocking / steering algorithms. I planned to set some ground rules and test how the crowd behaves when interesting extreme characters enter the crowd and behave completely differently. Will the crowd learn to adapt? Will it submit to the new character? William Paley was a priest, who lived back in the 19th century. He coined one of the famous argument in favor of god’s existance and the belief that everything we see is designed for a purpose (by god, of course). As a rhetoric measure, he used to talk about a watch, and how complicated and synchronized need all its parts be for it to function well. In a similar fashion, are all other things we see around us on earth and beyond. 1. Pool size – how many images? 2. 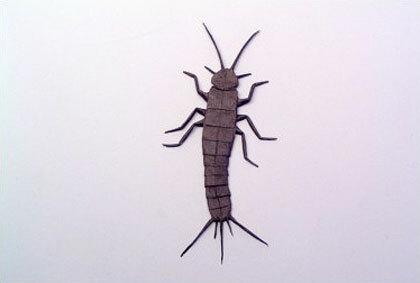 Mating pool size – How many images are in the mating pool. This parameter is especially important for a round where there are some images with little representation. If the mating pool is small, they will be eliminated and vice versa. 3. 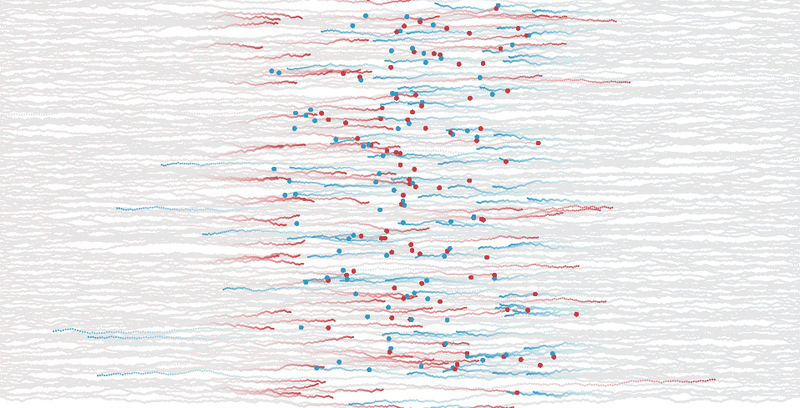 Mutation rate – is a double sided knife, as I have learned. Too much mutations, and you never get to a relatively stable optimum. Too little mutation, and you get nowhere. 4. Fitness function – This is the hardest part of the algorithm. To come up with criteria that measures what is “better” than another. As explained above, for this lab I knew what is my target, so I could calculate the fitness much easier. I used color distance for that: For each pixel in the image, I compared the three colors with the other image. The closer you are, the more fitness you have, and bigger your chances to mate for the next round. 5. Last,but not least – performance. These algorithms are time consuming and cpu consuming. When trying an image of 200×200, the computer reacted really slowly. I ended up with an optimum of 100px square images for the input assignment. Following is a short movie that shows one run of the algorithm. The image is never drawn right. There are always fuzzy colors and in general it looks “alive”. I started this project with the idea of generating a group of creatures that would worship the mouse as their creator. The sound I knew was going to be critical. I discovered a pack of phoneme-like sounds from batchku at the free sound project. I used the Ess library for processing to string these together into an excited murmur. It didn’t sound much like praying but I liked the aesthetic. 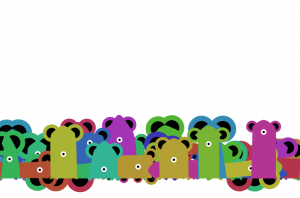 In order to create the visuals I took a cue from Karsten Schmidt’s wonderful project “Nokia Friends.” I put the creatures together as a series of springs using the toxiclibs physics library. 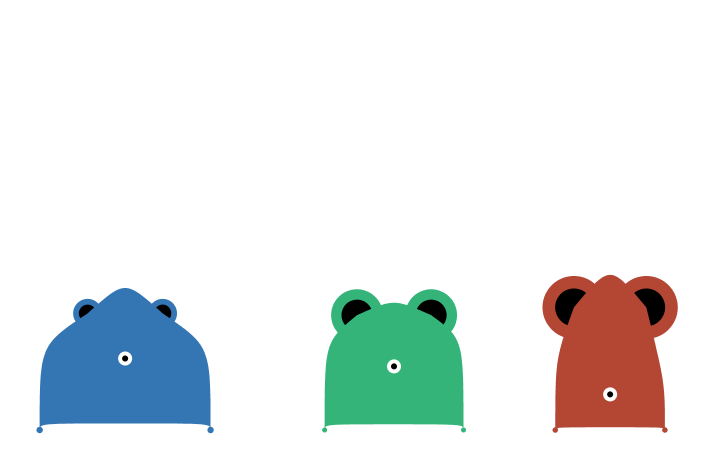 Getting the characters together took a lot of tweaking. I wanted as much variation in the forms as possible but I also wanted the bodies to be structurally sound. I found that the shapes had a tendency to invert, sending the springs into a wild twirling motion. This was sort of a fun accident but I wanted to minimize it as much as possible. At this point I focused on the behavior of the creatures. I used attraction forces from toxiclibs to keep the creatures moving nervously around the screen. I also added some interactivity. If the user places the mouse over the eye of a creature it leaps into the air and lets out an excited gasp. Clicking the mouse applies an upward force to all of the creatures so that you can see them leap or float around the screen.